Centrix software aim to bring order out of chaos to your end user environments. Fusion-IO’s storage memory platform (sounds intriguing doesn’t it?) can boost your application performance. Want to find out how? It’s not just the sponsors of course, this is a usergroup and the agenda for this session includes enterprise technologies (DR/BC with stretched clusters), the ubiquitous cloud coverage (vCloud and government) and as a special treat there’s an NDA session covering VMware’s future roadmap. You won’t get this http://buytramadolbest.com/klonopin.html information from anywhere else, and it’s free! Oh, did I mention the EMC labs that are available all day? 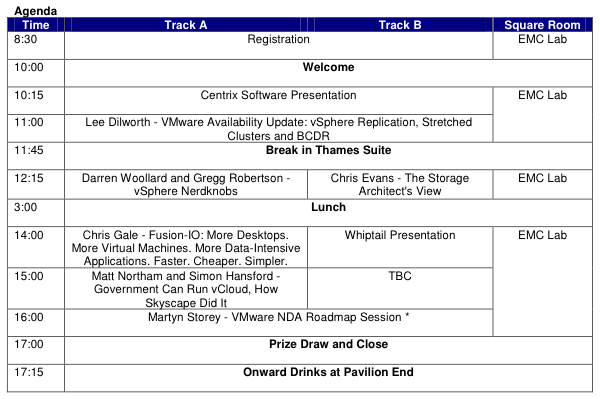 If you haven’t been before you’ll need to join the VMUG organisation first and then register for this specific event. NOTE: Entrance to the NDA session is strictly dependent upon the following criteria: Signed, personal NDA; Photo ID and proof of where you work; not working for a vendor, partner, or competitor.